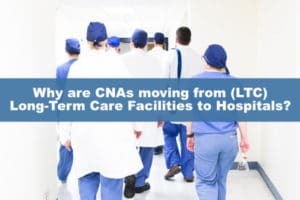 Nearly every one of the CNAs at a recent hospital stay started their careers in a long-term care (LTC) facility. Recently, I was an inpatient in a hospital after having surgery. While there, I visited with a number of nurses and CNAs (certified nursing assistants) while they were caring for me. Nearly every one of the CNAs had started their careers in a long-term care (LTC) facility. The reasons these workers moved on to a hospital setting for work is the main problem with LTC today. Caregivers (CNAs) are in very high demand and very short supply. LTC workers especially are underpaid and overworked. They rarely receive merit or cost of living raises. The facilities that desperately need them are having a very difficult time making ends meet. This is because Medicaid, which pays for nearly half of all LTC in the United States, pays nursing homes significantly less than the cost of care. Nursing homes which accept Medicare for rehabilitation care (their main source of revenue) must also accept Medicaid—the welfare program which pays for care when the patient cannot afford it. Thus, the nursing home has become the main place that will accept a person if he/she cannot pay for care in an assisted living facility. Assisted living facilities cost between $4000 and $8000 a month depending on care needs. Since they do not receive Medicare for rehabilitation care, they are not required to accept Medicaid, and many do not. Most people cannot afford the monthly charges for long without LTC insurance. The problem is that many people do not plan for care in later life, with investments or insurance that pays for LTC. Many of the residents in LTC facilities are on Medicaid, and most of them are in nursing homes. This is because the very nice assisted living facilities are rapidly deciding not to accept Medicaid because of its inadequate reimbursement for care. Back to the CNAs I met in the hospital. While there is a desperate need for caregivers, those caregivers need a living wage, and many long-term care facilities are unable to provide that. So, they migrate to the hospitals who can pay them and provide benefits. If you want to have good long- term care, in a place that appeals to you when your health changes, you need to have a plan to pay for that care or the odds may be good that a nursing home may be your only choice. Years ago, I purchased LTC insurance that will pay for the care I need, in a setting I will be happy in when that time comes. Will you? For more information, browse all of our resources at www.TheLongTermCareGuy.com.